Bold and spicy, Shiraz wines bring New World flair to a classic grape. A typical Shiraz wine is lush, fruity and complex with juicy, almost jammy flavors of fruits and berries. It is also a wine that is growing in popularity as Australia takes the world wine stage by storm. Many people are confused about the difference between Shiraz and Syrah. The two wines are actually the same varietal, genetically identical in every way. All match the grapes grown in France's Northern Rhône region, which are prominent in such wines as Hermitage and delicious, fragrant Côte-Rôtie. In general, wines called Shiraz are made from Australian and some South African grapes, while wines called Syrah come from the rest of the world. The distinction extends beyond location, however, and has expanded to become an indicator of the style of wines made from the grapes. Refined, Old World style wines made from the grape are often called Syrah, while the New World style wines with a heady fruit-forward intensity are often called Shiraz. While many people believe that Shiraz only comes from Australia, and that all Aussie reds from the grape are called Shiraz, these rules have changed somewhat as Australia has gained a foothold in the wine industry. Now some Australian and South African wine makers call their wines Syrahs to indicate that they are made in more of a refined Old World Northern Rhône style, while winemakers around the world may call their wines Shiraz to indicate they are a riper, juicer, more fruit-forward Australian-style wine. For instance, Australia's Clarendon Hills calls their wines Syrahs as an indicator of their Northern Rhône style wines while Washington State winery Columbia Crest labels one of their wines Two Vines Shiraz because of its powerful New World sensibilities. While the grape grows around the world, wines termed Shiraz are often those grown in hot environments that create a jammy, lush, highly concentrated wine. In Australia, the top regions producing the seductive and full-blooded wine are in the Barossa Valley, McLaren Vale, Coonawarra in South Australia, and Hunter Valley in New South Wales. Among this group, the Barossa Valley and Coonawarra vie for top rank but with distinctive characters. The Barossa Valley produces fruity, herbaceous, and peppery Shiraz, whereas Coonawarra's Shiraz wines are intense with spicy flavors. Wines from both regions have sturdy tannins and complex structure that age well. In South Africa, the wine regions are mostly in the Western Cape near Capetown, which produce big-fruit wines with chocolate, smoke, and spice. Elsewhere around the world, you can find some winemakers that label their wines as Shiraz as an indication of the wine's style. Australian Shiraz often contain bin numbers on the labels as a qualifying name or reference. For example, Lindemans Bin 50 identifies their easy-drinking Shiraz from multiple regions. This common practice has been around at least since the 1930s, and many winemakers follow the tradition. The bin may reference a particular aging and blending style, or it could indicate a physical location where a specific wine was stored. Another Australian approach is to blend varietals and labeling their wines based on the combination. Shiraz is regularly blended in various combinations with traditional Rhône grapes like Grenache, Mourvèdre, and Viognier. When the winemakers blend Shiraz in this way, they put the blend's names on the label. If a wine label says -Grenache-Mourvèdre-Shiraz (GSM), you know what's inside. Australians also like to produce red sparklers and port-style wines from Shiraz and the results while offbeat, are appealing and uninhibited. 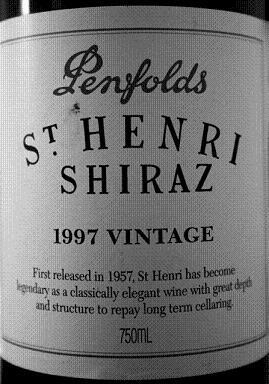 Penfolds makes consistently good wines ranging from the inexpensive Thomas Hyland Shiraz to the top of the line Penfolds Grange. Elderton produces award winning Barossa Valley Shiraz wines, including the spectacular Elderton Command, which consistently scores in the 90+ point range and costs under $100 per bottle. Two Hands is a Barossa Valley winery producing an array of consistently delicious Shiraz wines with great label artwork. d'Arenberg wines in McLaren Vale meet the very standard of New World wines: bold, audacious, daring and thoroughly intriguing. Try the Laughing Magpie, a delicious and fragrant Shiraz Viognier blend, or the opulent and intense The Dead Arm Shiraz. Shiraz wines and blends are popular around the world for their bold flavors, spice, ripe fruits, and easy accessibility. For many, these wonderful wines serve as the gateway to red wine drinking because of their opulent jamminess. With such a wide array of affordable and delicious New World wines coming out of Australia and South Africa, you're sure to find a Shiraz that meets your budget and suits your taste in wine.